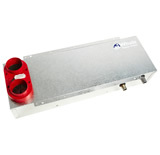 Uses both gas and electric simultaneously for higher heat output. A new range of gas and electric Space Heaters for internal installation. A new range of gas and electric Space Heaters for underfloor installation.